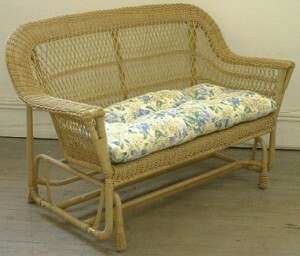 Wicker furniture cushions are an essential part of standard wicker seating furniture. To thoroughly enjoy standard wicker, you will want to choose a good set of cushions that look and feel great for inside your home or patio using a fabric that is appropriate for the location and that complements your furniture and decor. Typically when people refer to wicker furniture cushions they are referring to tufted seat cushions for standard wicker furniture. Standard wicker furniture is wicker furniture that can be used with or without cushions. When you do use cushions, you use only seat cushions. Back cushions are not recommend for standard wicker because the depth of the seats are not sufficient as to make the furniture comfortable if back cushions are used. Although there are many new types of wicker available today, we will only be discussing the cushions for standard wicker. Wicker furniture cushions for chairs, love seats, rockers, sofas and gliders have distinctive shape. Rather than rectangle or square shapes with square corners, wicker furniture cushions have rounded-off back corners on the seat cushions to conform to the shape of the wicker seats. Common chair, single gliders and rockers typically use either 18in. x 18in., 19in. x 19in. or 20in. x 20in. cushions. Love seats, double gliders and porch swings typically use either 41in x 18in, 42in. x 19in. or 46in. x 20in. cushions. All these cushions will have rounded-off back corners. These are the most common sizes you will see for sale at a retailer. Although these are typical sizes, that does not mean they are the only sizes. You may have a different size. If you do, you just need to take accurate measurement and have a set made to your specifications by a cushion maker. You cushion maker will assist you in determining the sizing for your wicker frames. To hold the polyester fabric in place and keeping it from clumping. Aesthetics – Tufting adds shape to what would otherwise be a flat smooth cushion. Firmness and thickness – The more tufts in a cushion, the thinner it will be and the more firm it will be. When you get tufted cushions made, you will typically have the option to choose how many tufts you want in each cushion. Chair seat cushions will usually have one or four tufts. Love seat cushion can typically have one row of three tufts, two rows of three tufts or two rows of four tufts. You typically would like to coordinate a chair with one tuft with a love seat with one row of tufts and a chair with four tufts with a love seat with two rows of tufts. When you get wicker furniture cushions made for your wicker set, choose a fabric that is appropriate. If you are using the furniture and cushions indoors, you can use indoor, all-weather, olefin or Sunbrella fabric. If you are having cushions made for outdoor, you can use all-weather, olefin or Sunbrella fabric. If you are in an extremely sunny location such as in Florida, you really want to consider using Sunbrella fabric. Sunbrella will provide the best protection against fading and deep cleaning for a very long time. Wicker furniture cushions are tufted cushions that fit the shape of wicker furniture with rounded-off back corners. Measure your furniture seats to determine the size you need. If your retailer does not offer the size you as a standard, ask them if they can make you a set to fit your furniture. Choose the number of tufts to meet your aesthetic as well as our comfort needs.